The weekend before I went on strike with my fellow Los Angeles teachers, I scoured the internet, looking for tips. Oddly enough, I found a plethora of articles geared towards parents about teacher strike preparation, but none for educators themselves. Sure, our staff prepared signs, set up a group chat on WhatsApp, and made arrangements for a couple of bathroom and parking options, but what else could be expected? The last strike in our district was thirty years prior, and we didn’t have a point of reference. As educators in Denver, Oakland and Virginia prepare for a work stoppage, here are a few insights I gleamed from the experience. Emotional roller coasters are normal. Waking up the morning of Day One, a strange feeling churned in the pit of my stomach. Not only was I nervous, I was also scared. Since I had voted yes for the strike and thought it necessary, I couldn’t account for the fear. Yet underneath my resolve, I felt afraid. As the days progressed, I experienced a rainbow of emotion: exhaustion, joy, sadness, pride. Most colleagues shared the same feelings at some point during the experience. Anticipate the weather and dress accordingly, paying special attention to the feet. 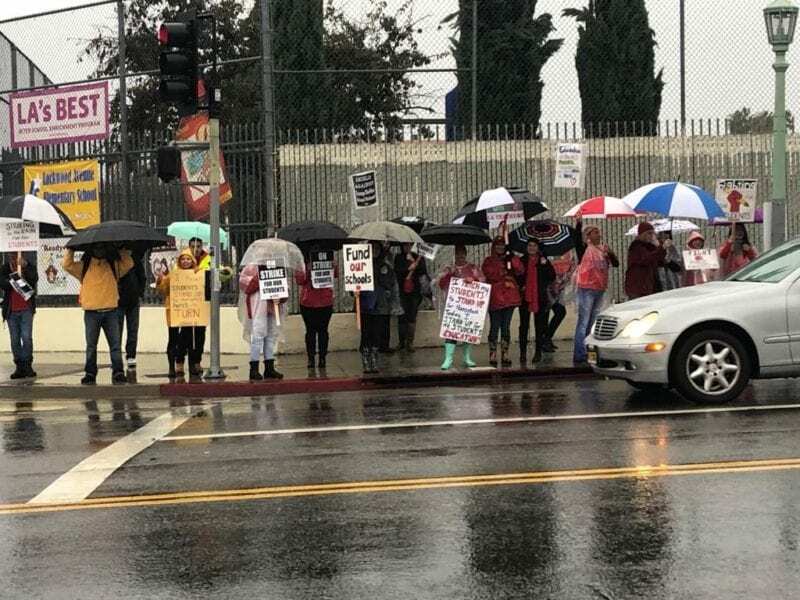 Typically sunny Los Angeles had intense rainfall the first four days of our strike. Obviously, I needed my footwear to not only be comfortable, but to also keep my feet dry. Rain boots, gloves, hat, rain poncho and sturdy umbrella helped me survive the conditions. Plan for the forecasted weather ahead of time. After a day on the picket line, the last thing you want to do is to go shopping. Limit liquids if restroom access is an issue. Even though I needed my morning coffee and to keep hydrated, I learned to be strategic in the timing of my consumption. Speaking of bathrooms…don’t be afraid to ask small businesses or random places. The Bureau of Street Lighting is around the block from our school. In a pinch, we asked to use their restroom, and they gladly opened their doors to us. “A strike day is a work day,” it has been said. However, by quitting time, the day proved to be more emotionally and physically draining than a day in the classroom. Between the rallies and the picket line, tens of thousands of steps were taken. Take time to get extra sleep and rest, and plan nutritious meals and snacks. In the late afternoons and evenings, surround yourself with loved ones and indulge in your favorite pastimes. The chants will replay in your head once you go home. You’re not going crazy. This happened to almost everyone I spoke to, and you just have to go with it. Try not to stress about your future diminished paycheck. Even though I had managed to sock away some money, I found myself worrying about worst-case scenarios. I learned to have faith. In the end, our strike lasted seven working days, not as long as some had predicted. To help ease the financial stress, our union negotiated an arrangement with the district to spread out the deficit. People will have their opinions, and not everyone will be on your side. “If you care so much about the kids, why aren’t you in the classroom?” A colleague was questioned at a grocery store by a stranger. Even family members may have a differing view. It’s important to clarify your position to yourself, and own it. If someone asks, you’ll be ready to calmly stand your ground. Some people oppose work stoppages, but at the same time, supporters are out there and will make themselves known. 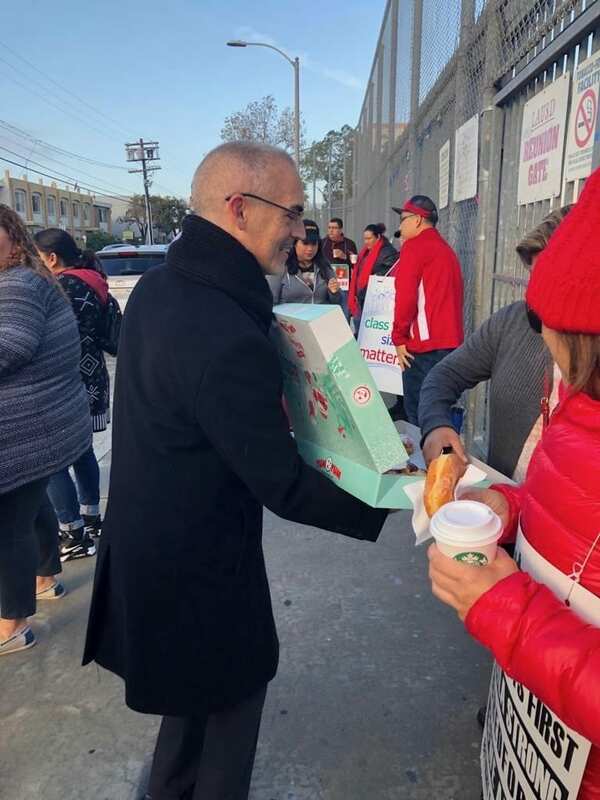 Over the course of our strike, I was overwhelmed by the generosity shown by family, friends, neighbors, and acquaintances. Random people from the community stopped by and gave us coffee, donuts, granola bars, and encouragement. Focus your energy on the greater good. From Day One, our staff agreed that our strike went beyond the paycheck. We were standing up for all of our students. 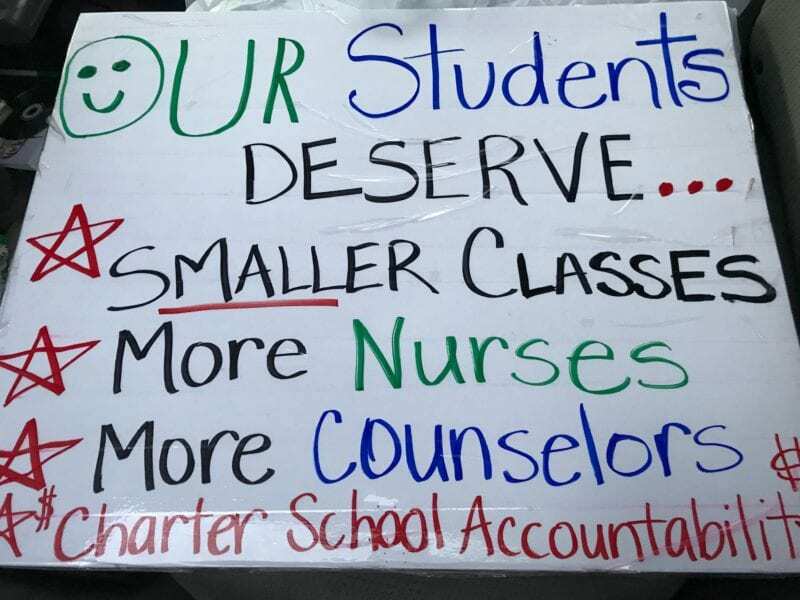 We were advocating for the need for smaller class sizes, more nurses, counselors, and other resources our kids (most of which are Title 1) desperately need. Someone, somewhere will cross the picket line. Instead of spewing anger at the subs or district personnel, we agreed to strike with love. We spent our energy on communicating our message to the community. Our collective voice was kept positive. Expect nothing, but be open to everything. By the time Day Seven wrapped up, the camaraderie amongst the teachers at my school was only strengthened. We even laughed about how drenched we were the first four days. We had helped each other through the highs and lows, and in the end felt satisfied with the gains achieved. Hopefully, your union will bargain a fair deal with the district. The wave of teachers strikes around the nation is proving successful. Stand firm in knowing that others have walked the line, and we all support you. We are with you in spirit. We hear you. And you will be heard. 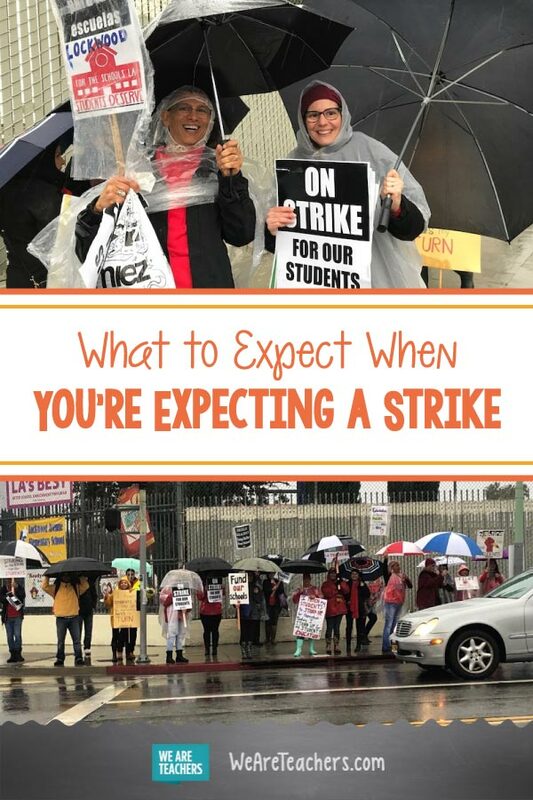 Do you have any teacher strike preparation tips or other things you wish you’d known? Come and share in our WeAreTeachers HELPLINE group on Facebook. 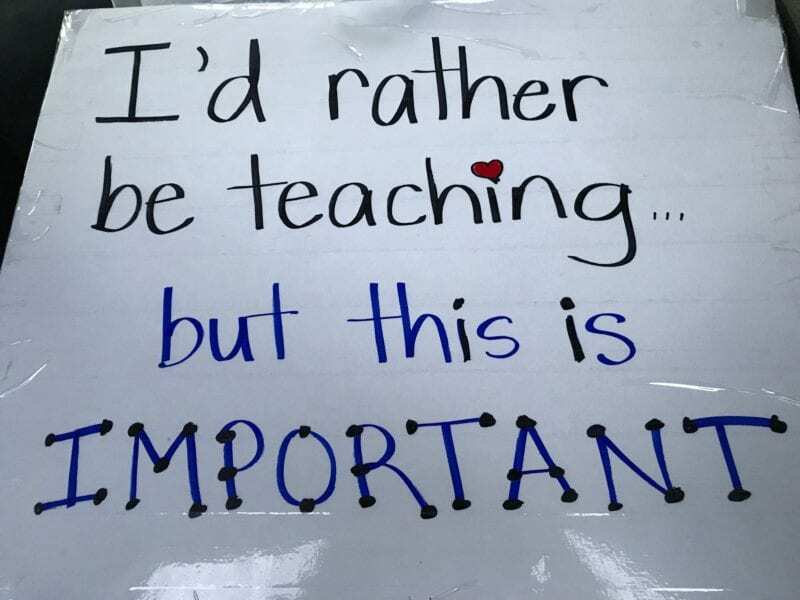 Plus, why we all need to support teacher walkouts. Next articleMedical News Today: Diabetes: Could a pill replace insulin injections? Do Your Students Need Help With Pencil Grip? Try These Tricks!